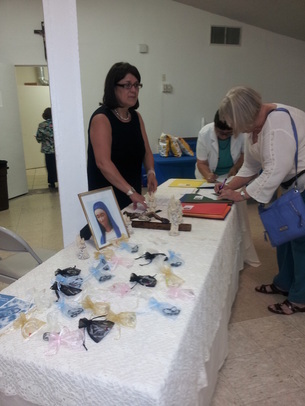 Monday, July 1, 2013 is the third anniversary of Little Handmaids of Our Sorrowful Mother. 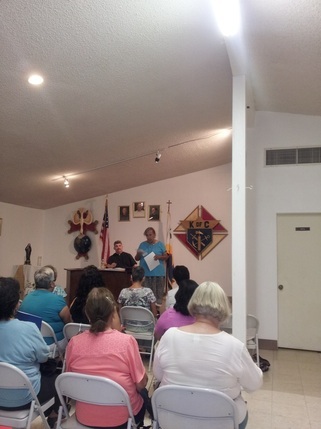 However, we have already celebrated here in Del Rio, Texas on Tuesday, June 25, because that is the day that our spiritual director, Fr. Moreno, could give his Spirit-filled presentation on Christian Prayer: A Way to Compassion and Contemplation. It was a beautiful night, filled with the Holy Spirit, and it seemed that all of the 65 or so guests were blessed. At that celebration five women expressed the desire to become little handmaids. I want to share with you what the Lord has been communicating to me regarding the Little Handmaids. About a week before the celebration, the Lord gave me the following words as I woke up: “Holy wildfire…It will spread!” We are already feeling the results of that holy wildfire. I feel Your Presence in me, Holy Spirit, like a wildfire that is clamoring to spread. 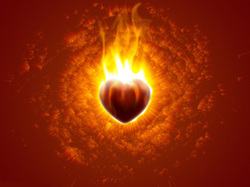 I feel that it is a fire that is in me and spreading from me—that it is in the hearts of the other little handmaids and spreading from their hearts. I believe it is a fire of compassion that lives in the Suffering Hearts of Jesus and Mary, and I see that it is a great gift that we have received from You through Our Sorrowful Mother. It is a cleansing fire, a healing fire, a fire of salvation. Do You want to say more to me, Holy Spirit? I had an image of tossing a disc out into water, and it was skimming on the surface of the water. “Launch out into the deep. Jesus is the Pilot of your boat.” Thank You for Your holy words, Holy Spirit. Do You want to speak to me about the Little Handmaids? “The boat is My Heart, beloved little handmaid. Believe that I am with you at every moment. My love is constant and ever present. Trust in Me! Thank You, Lord, I trust in You. Please heal my lack of trust. Do you want to speak to your little handmaids? I had an image of Mary holding a bouquet of purple flowers, and I understand that the bouquet is the Little Handmaids of Our Sorrowful Mother. It is the prayers we offer with love for you, Mother, and for Jesus. It is the honor we give to you, our hearts that become more and more beautiful, the more totally we consecrate ourselves to Jesus through you, the more completely we place ourselves trustingly in your hands. Do you want to say more, Mother? “You said it all, my child.” I experienced Mary smiling at me. It is my hope and belief that that holy wildfire will spread in places other than Del Rio, Texas. If the Holy Spirit is whispering to you to lead a Seven Sorrows Rosary group in your parish or to initiate some other ministry in honor of Our Sorrowful Mother—with your pastor’s permission, of course—please say, “Yes!! !” Every yes brings abundant blessings. I send you the love of Our Sorrowful Mother and her Suffering Son, Jesus! 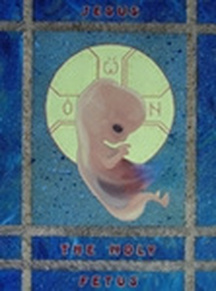 "Behold the handmaid of the Lord. Be it done unto me according to Your word." When our children are hurting and we can’t to seem to help them, we can only pray for them. I have learned to turn to our Sorrowful Mother because she knew firsthand what it was like not being able to do anything as our Lord fell carrying the cross and the people were mocking him. They looked at each other but they knew all that could be done was pray and trust God. Somehow when I join my sorrow and the pain that I feel to that of our Sorrowful Mother in the Rosary of the seven sorrows my pain is not as heavy anymore and I’m able to breathe. In 2001, I was diagnosed with a mental disorder called bipolar disorder which brings on depression, anxiety and all other kinds of mental issues. I remember my mother had to rock me to sleep because I was having night terrors and my husband was unable to take care of me. I was praying to our blessed mother 24/7 even though my doctor asked me to stop because he thought this was hurting me more than it was helping me. But I continued to pray to our Blessed Mother because this was the only way I found relief from the fear and the darkness that had overpowered me. I was battling with my past and my son had joined the Army and was going to be sent to Iraq. Then a few weeks later the towers were hit by terrorists. And like Mary’s heart, my heart felt like it was pierced with a sword. 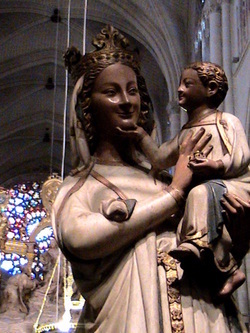 Blessed Mother, how did you withstand such agony? I prayed and asked for prayer for my son. The Lord answered our prayers and my son was spared from going to Iraq. I feel that our Blessed Mother has always been there for me guiding me, never leaving my sight. And especially thru the darkest times of my life, she has been holding me by the hand taking me to the light of Jesus. Thank you Camy for spreading this devotion thru the Handmaids of Sorrowful Mother. "...we, along with Them, suffer with those innocent people who can't speak for themselves." I really enjoyed the Anniversary Celebration. Finally I understand the importance of the Little Handmaids. I always wondered why it was always about suffering. After listening to the presentation, I realize that it's not us who are always suffering, and that Jesus and Mary are not always suffering either, but that they, and we along with them, suffer with those innocent people who can't speak for themselves. Example: Texas trying to set tougher abortion laws, saying a fetus feels pain after 20 weeks, but they can't let us know. And who's to know, maybe they feel pain from conception, and they can't let us know. People are abused in nursing homes, and many have no one who cares. This new knowledge has made my soul, and those of many others realize why we have been called to identify with the suffering hearts of Jesus and Mary. May they always help me to help these and other people who suffer in silence. On June 30, 1954, my mother gave birth to my eldest brother. Daniel's birth was a difficult breech. Dani had a congenital heart defect, and during the delivery, he was deprived of oxygen and suffered serious brain damage. The doctor told my mother to prepare for his death because he was too weak to survive. My father was in the Air Force and stationed in Korea at the time, so my mother had to deal with everything on her own. My parents, being devout Catholics, went on to conceive eleven more children. In those days, no one had to ask if you were pro-life; it was plain. Mom suffered two miscarriages, a still-birth, and infant death, but Dani survived along with seven others. I grew up learning that children were always a blessing, and that some people are different and some people needed more help than others. Dani could never speak, walk, feed himself or go to the bathroom. He could let us know when he was happy or angry or sad. He loved the pool, guitar music, car rides and his favorite toy was a Slinky. He taught us to be compassionate. 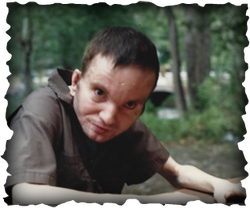 He required a lot of care, but he was never considered a burden. My mom always said, “He is a saint living among us”. Our family faced many challenges with Dani, and my parents had on-going sacrifices. We could never all go to Mass or anywhere for that matter, as a family, because someone stayed home with Dani. Certainly, Mom's faithful devotion to the Rosary carried her through many trials. When I was three, my Dad was sent to Viet Nam for a year, leaving my Mom with six young children. I have a clear memory of praying the family rosary every night until he came home. Mom followed every apparition of the Blessed Mother and constantly talked to us about Fatima, Lourdes, Akita, Garabandal, Guadalupe. When I was fourteen, I enrolled in the Blue Army of Fatima. Raising us in Las Vegas, Sin City, Mom was keenly aware she was fighting a spiritual battle for her children. We certainly had our share of divorce, crisis pregnancies, drug and alcohol abuse among my siblings. When I was in high school, Mom and my future mother-in-law, went to Medjugorie. I am so blessed to have these two amazing examples of motherhood in my life, each living out their powerful pro-life message in their own way—my mother-in-law as a fierce activist, and my own mother in her quiet way caring for Dani, both with the rosary in hand. Their faith was challenged constantly by the tumultuous era in the Church and the wide-spread acceptance of contraception and abortion. They watched in horror as each of their children were lured by the distractions of the world. My brother was laid off work and was struggling with drug addiction. He was becoming increasingly depressed and moved in with my parents. He spent his days, helping my aging parents to care for Dani, until he could get his life together. Although Dani couldn't speak, he admonished his little brother just by being. “What's wrong with you? Why are you feeling sorry for yourself? Look at me! Can I run, play the guitar, travel around the world? You can do whatever you want, and you are choosing to waste your precious life. What is wrong with you! ?” In his weakness, Dani saved my brother's life, and turned him in a new direction. He showed our family that every life has value, even when it doesn't meet the world's standard of 'quality'. Dani has had a tremendous, irreplaceable impact on our lives. Dani died, at age 47, on January 22, 2002, the anniversary of Roe vs. Wade. Dani is a powerful intercessor for our family, for children with disabilities and for the unborn. With modern prenatal testing, many babies like Dani are never born. Their families will never know what they have lost. Just because some of us were born healthy, it does not guarantee that we will be perfect people. Nothing can guarantee that. Just over a year ago, my Mom gave me a book. It was the compilations of the messages from Our Lady in Medjugorie, Words from Heaven. I couldn't get enough, so my sister loaned me the book about Our Lady of Kibeho. This is where I discovered the devotion to the Seven Sorrows. I was searching for a Servite Rosary on the web when I stumbled onto the Little Handmaids. The next thing I knew, I and several members of my family, including two of my siblings, went to the Fourth of July gathering at Caritas of Birmingham last year. 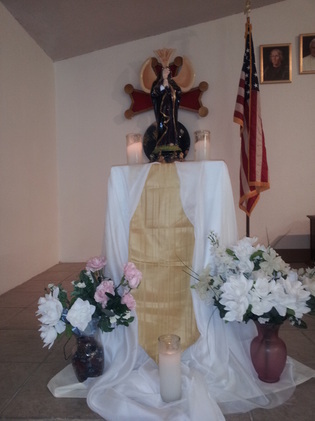 The main message we took from there was that Our Lady asked us to form prayer groups. Since then, my parents, my sisters, and all my children have been praying the family rosary after Sunday brunch. We have been showered with blessings and a renewed sense of closeness and peace. My husband and I have raised six children in Sin City. Our faith is the only thing that could possibly hold us together in the wild west. My oldest daughter has been discerning a vocation to the the religious life. She will be entering the Sisters of Life on August 31. Certainly, Uncle 'Saint' Dani, has been putting in a good word for her. "By her merits, I dare to approach the Father with her at my side..."
I love to pray the rosary of the seven sorrows of Mary. I know that any mystery in the life of Christ and every moment that He lived while on earth has been made an eternal moment because He is the eternal God. While those moments passed in history in the eyes of the world, they remain suspended for all eternity through the humanity of Jesus. When I pray those mysteries in the rosary, I am placing myself into those eternal moments of Jesus' life and watching the Blessed Virgin Mary's role in those mysteries, shows me how I ought to respond. I am in her 'school', as the soon-to-be saint, Pope John Paul II used to put it. I start each mystery by calling to the Father and asking Him to look at our Mother Mary, and for pity of her to grant our prayer intention. By her merits, I dare to approach the Father with her at my side and together, she and I pray the Our Father together. I then take some moments to picture the mystery, placing myself in the scene. I will sometimes take the role of others too, such as the good thief, Simon of Cyrene, John the Evangelist, etc. When a moment lifts me up in contemplation, I rest in it, and resume the rosary when it subsides. I must remind myself often that the most important thing about praying the rosary, is not in getting the words said but in listening to God and allowing Him to change my heart. Pray for us, O Sorrowful Mother of God, that we may be made worthy of the promises of Christ. "At that instant I wanted to change, I wanted to be a better person, I wanted to live for Christ by showing love..."
What a beautiful celebration! Everything came out according to plan, and if something didn’t, it was improvised very well. The 7 sorrows rosary sounded like a harmony of many people. I absorbed Father Moreno’s words like a sponge! At that instant I wanted to change, I wanted to be a better person, I wanted to live for Christ by showing love for myself and neighbor! I learned that a little handmaid always needs to be happy and look happy; this is important so that others can feel God’s compassionate love. If you want to feel the compassionate love of Our Sorrowful Mother, listen to the song “Come to the Cross,” and you will be at peace and very happy on this earth and in eternity. "The Most Holy Virgin taught me the value of suffering." Cami, I have read, with a great hunger for holiness, the testimonies of the Little Handmaids of the Sorrowful and Immaculate Heart of Mary. I have consumed them like a delicious delicacy, that cures and heals the wounds caused by the sin of the world. I have felt that my cross is easy and my burden light. We persevere, Little Handmaids, in this human effort, through the heavenly pleasure of Our Sorrowful Mother. Several days before the Celebration of the Third Anniversary, I realized that it was going to be a success. The Most Holy Virgin taught me the value of suffering. I remained in continuous pain, which seemed like being nailed to my bed. She, my Mother, offered me to the Most Holy Trinity for the Little Handmaids, that they can face the spiritual battle that exists between God and His enemy. I give testimony that, in this battle, we are not alone. I saw that, in my pain, which was beyond my strength, that the angels, archangels, and my guardian angel sustained me; there were many; I don’t know how many. The souls in purgatory heard my call and through supernatural means , where the blessed souls gave me consolation and unimaginable relief. The Most Holy Virgin and St. Joseph lift up our rosaries and prayers, in reparation for the injury inflicted on the Hearts of Jesus and Mary through our sins. Little Handmaids, don’t be afraid of pain, of sickness, nor of any kind of problem that appears to have no solution. Our Sorrowful Mother is present before God our Father, before her Son, and before her Spouse, the Holy Spirit, for each one of us and for all our children. She is crying out to God with a great cry and tears of blood, which are transformed into relief and rest for us, her children, all of whom she loves with an equally great love. Through my questions to Jesús and Mary, I realize how easy it is to communicate with them and to receive an answer. By means of my pain they have made songs of adoration and praise to burst forth from my mouth—old songs, not modern ones—and so with my pain I spent the hours of the night singing, “My Jesus in the Blessed Sacrament, I love You and I adore You. You have hidden in the Sanctuary because You have desired to be with me.” As the night was long, I continued singing, “Blessed, Blessed, Blessed be God, the angels sing and praise God. As my pain increased, my songs also increased. “Long live Mary, long live the Rosary, and long live Jesus Christ in the Blessed Sacrament!” I believed that I understood that these songs are a delight, and that in heaven they are accepted with great joy. While I have been singing them on several occasions, and when the souls in purgatory sing, which I have heard through the grace of God, I understood that our songs, that we lift up here on earth, are a fragrance that gives a sweet scent to the earth and cleanses it of the foul odors of sin. Cami, you know me and know that I could say more about this marvelous relationship with Jesús, Mary, and Joseph. If God preserves my life for another couple years, I will gladly share with the Little Handmaids, with those who desire to know, the greatest means to succeed in the salvation of souls. I already enjoy it. I pray that you do not grow weary, for everything is for the glory of God and that the Reign of the Hearts of Jesus and Mary comes soon.